Hi! I have eight hand-made blown glass fruits and veggies for sale as a set in one lot (eight in great condition plus one extra broken garlic included in the sale for free). All were purchased in the 1980s and early 1990s and we were told by the sales staff that most were Murano Glass (but they are not signed so I cannot confirm that). They are all quite heavy and solidly built. They cost between $10 and $15 each at the time (so that's about $100 in 1980s money). I am asking $20 for all eight plus one free (nine in all). At least I think it's a lime? Maybe a grapefruit? This round bumpy green fruit measures 3.5"L x 3.5"W x 4"H.
This lovely piece of glass will stand up on it's own and it measures 3.25"L x 3.25"W x 7.5"H.
This stylize bunch of glass grapes measures 3.5"L x 3.5"W x 6.5"H.
Measuring 1.75"L x 1.75"W x 7.75"H, this glass carrot has one of it's three greens broken at the tip. This tomato will stand upright on its own and measures 3"L x 3"W x 5"H.
Sadly, the garlic has two of its green tops broken. (I have one of the broken pieces if you want to try to re-attach it. It broke while I was photographing so the picture shows two stems.) I was thinking of throwing it away but why not include it in this set as an extra. When these pieces of glass are displayed together in a bowl, it is hard to tell that anything is broken. It measures 2"L x 2"W x 3"H.
This smaller glass strawberry measures 1.5"L x 1.5"W x 3.75"H.
This larger glass strawberry measures 2.25"L x 2.25"W x 4"H.
Finally, this glass banana measures 1.5"L x 1.5"W x 7.25"H.
I am located in Vancouver, BC but shipping is no problem. 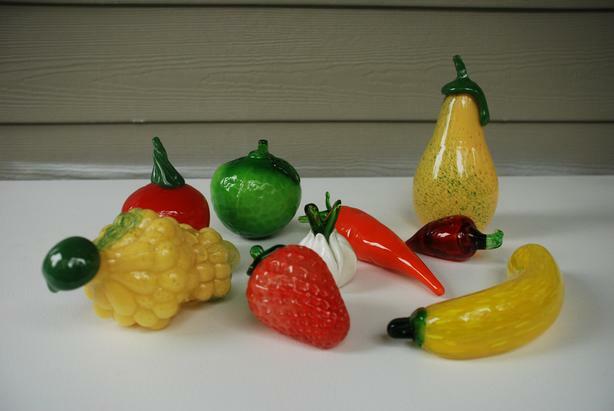 I will be happy to mail these glass fruits and veggies to you using CanadaPost and Interac bank transfer. So, if you are interested in purchasing, e-mail me and we'll figure out the logistics and/or I can answer any questions you may have. Thanks!